Semtech Corporation (Nasdaq: SMTC), a leading supplier of high performance analog and mixed-signal semiconductors and advanced algorithms, today announced its silver sponsorship for The Things Network’s (TTN) LoRaWAN™ Developer Conference, Feb. 1-3. The IoT conference will focus on in-depth knowledge and skills by hosting a variety of sessions for attendees to learn how to build and adopt a LoRaWAN network. A variety of speakers from the industry will present including Nicolas Sornin, one of the principal architects of Semtech’s LoRa® devices and radio frequency technology (LoRa Technology). Attendees of the LoRaWAN Developer Conference will also receive a free basic LoRaWAN online training to allow people to further learn more about the benefits of the LoRaWAN open protocol. The event is co-located with the LoRa Alliance™ Member Meetings, Jan.29 – 31. 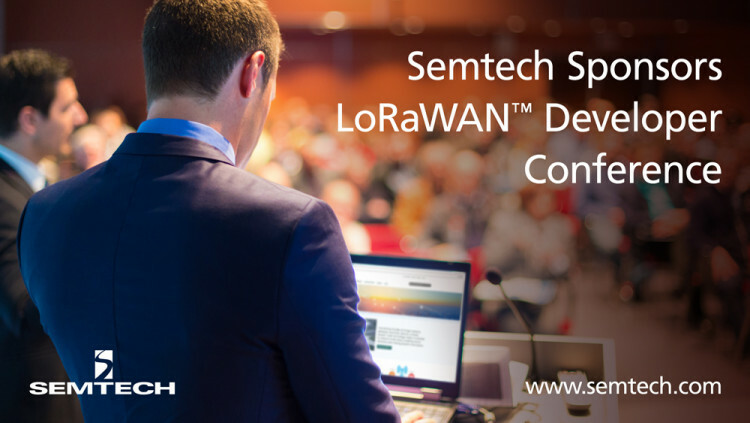 “We are very happy to have Semtech as one of our sponsors and contributors for our international LoRaWAN developer conference. Over 500 developers from across 25 countries around the world will be working hands-on with the latest and greatest in the world of LoRaWAN, while 30,000 others are expected to participate online,” said Wienke Giezeman, CEO and co-founder of The Things Industries. For more information about the developer conference, visit the website. All statements contained herein that are not statements of historical fact, including statements that use the words “will,” “opportunity to,” “designed to” or other similar words or expressions, that describe Semtech Corporation’s or its management’s future plans, objectives or goals are “forward-looking statements” and are made pursuant to the Safe-Harbor provisions of the Private Securities Litigation Reform Act of 1995, as amended. Such forward-looking statements involve known and unknown risks, uncertainties and other factors that could cause the actual results of Semtech Corporation to be materially different from the historical results and/or from any future results or outcomes expressed or implied by such forward-looking statements. Such factors are further addressed in Semtech Corporation’s annual and quarterly reports, and in other documents or reports, filed with the Securities and Exchange Commission (www.sec.gov) including, without limitation, information under the captions “Management’s Discussion and Analysis of Financial Condition and Results of Operations” and “Risk Factors.” Semtech Corporation assumes no obligation to update any forward-looking statements in order to reflect events or circumstances that may arise after the date of this release, except as required by law.